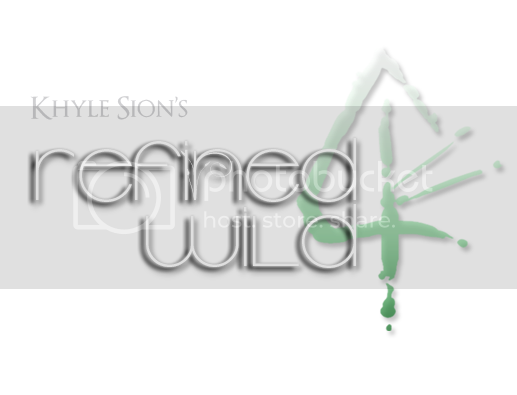 ~Refined Wild~ at the 3rd Annual Relay for Life Christmas Expo! Yearly Relay for Life Events: You can never attend just one! Yes, yes, yes, I know what you're thinking. Hey, Khyle, yo' crazy. You already did a Relay for Life event this year. A big one. You built an entire sim. Don't you think you've had enough? Well, buddy. I'll tell you when I've had enough. So, yeah! 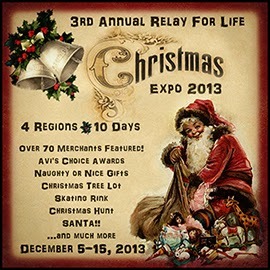 Refined Wild will be at the 3rd Annual Relay for Life Christmas Expo. 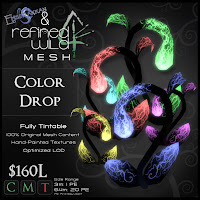 My good friend (and motion artist) Methias Kira from [-Abstract Soul-] is going to be selling in his very own booth this time around! Unfortunately, I won't be doing anything too extra-super-duper-special for this event. No art installations. No sim-wide builds. I will be selling a couple of new products, will have something nice in the raffle and I will be displaying a themed Christmas Tree! Boy, I didn't think this post would end up as long as it did - so I've split it into two parts. In Part 1 of this tutorial, I explained about traits of Good Criticism, Poor Criticism and how to tell the subtle differences between them. In Part 2 of this tutorial, I'm going to take some time to explain what to do with the Good Criticism once you've got it. Receiving a decent critique is one thing - what you do with that decent critique is an entirely different story. If you can't handle criticism, don't become an artist. I've said this more than once in my life, and will likely say it more in the future. A lot of people who delve into this field cannot take a lick of criticism, whether good or bad. In the context of Second Life, I've seen merchants who would rather shut down their businesses and remove themselves from the grid entirely, than taking criticism gracefully and working to improve. Many simply ignore the criticism and do not improve, nor change (and then complain about the fact that they don't sell anything). Others cannot come to grips with the idea that no matter what they do, there will be someone, somewhere, who will dislike their work. There will always be someone who does better work than you. There will always be someone who hates your art. 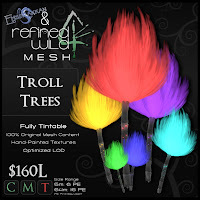 Crystals, Troll Trees and Color Drops! 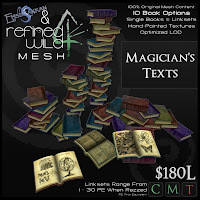 Click the product images and be whisked away to the marketplace! 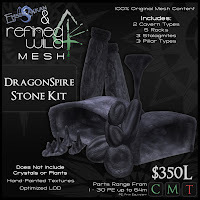 Just so that people are aware: I will be putting the mesh tunnels up for sale. I have no idea when that will be. Whenever I can devote time to re-purposing them for individual use. Hopefully by the end of summer/early fall. Make sure to check back for updates! What a long, strange month it's been. 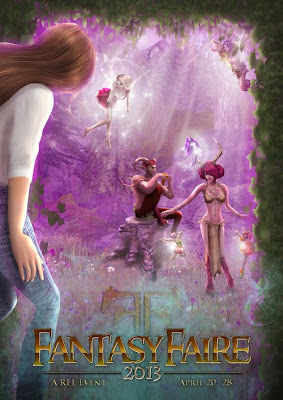 This year's Relay for Life Fantasy Faire is now over - aside from the grand "Key of Hope" hunt, produced by Mad Pea Productions (an incredible in-world artistic group), which I believe goes on until the end of the week. This year, the Fantasy Faire blew through the previous year's record of $25,000 US and sailed right over the $30,000 US mark. This was an incredible achievement, for everyone involved - the organizers, the merchants, the volunteers, and the sim builders. I can really relate to the sim builders. This year, I had the honor of being one of them! So, as you can probably surmise, I'm pretty tired right now. It's been an extensive, tiring and complicated month for me. Want to read about it? Visit Ciaran Laval's Blog and read the interview! The entire month of April seems like one large blur, at this point. Fragments of clarity intermingled in a tangled web of creation and hastened teamwork. When all was said and done, I barely had a chance to look around the sims and enjoy the Faire myself! 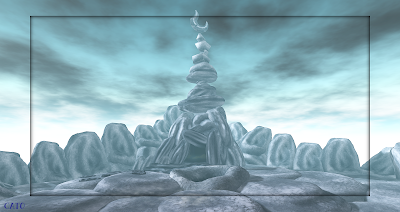 The DragonSpire was easily the largest, most ambitious, complex thing I've done in Second Life (so far). 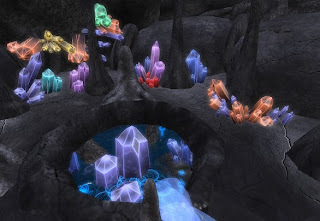 It was also a first for the Fantasy Faire, and likely a first for Second Life - a sim containing a series of seamless underground caverns. Like a proverbial cherry on a proverbial sundae, it was topped with a spire that towered over the sim like a massive colossus, hiding within a dragon and its horde of gold and jewels. When I say the sim was huge, it's a bit of an understatement - I thought I would be able to fit it snug as a bug on ground level, but complications with the sim's water level kept that from happening. 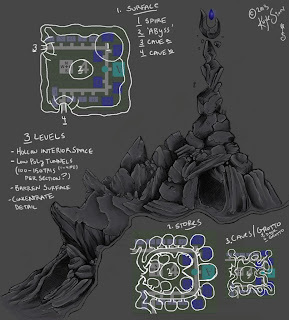 The entire mountain was 3 layers thick - forming the catacombs below, the shops in the center, and the spire on the top - and the entrances to the sim had to be reached by climbing a natural stone stairway. It was a great opportunity for me to show off my Blacklight Crystals, as well. These things were used everywhere. I spent at least a week or two extensively planning what I was going to do. In hindsight (which is always 20/20), I think I might've been a little too ambitious with this project. A sim-wide build with seamless mesh tunnels and a dozen integrated shops with only a tentative month to finish it? Perfect! Let's do it! 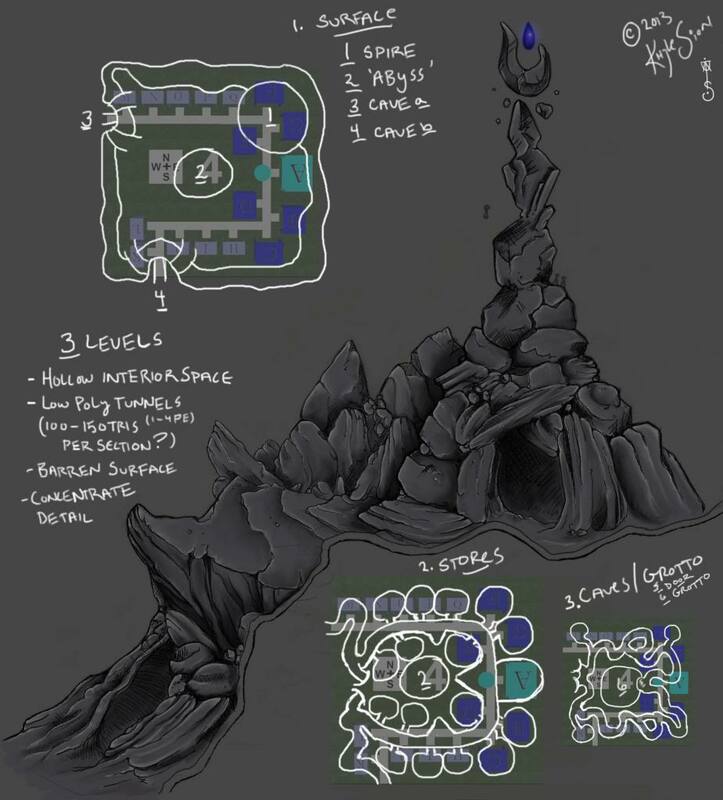 DragonSpire concept art - mapping out the levels. Yeah, I'm a little crazy. I know. I had also promised Zachh Barkley (owner of The Arcanum) that I would do a bang-up job on his shop, as well. Usually a larger version of the smaller shops are created for the sponsor store, but I wanted to do something a little different, that fit better with the surroundings. I customized the sponsor shop not only to fit his product base, but to showcase his work as effectively as possible. In fact, I focused a lot on all of the merchant's stores. I really wanted to make sure that people weren't just moving through the sim - I wanted to make sure everyone found their way into all the stores, dropping lindens into whatever donation (and non-donation!) vendors available. I'd noticed that, in years previous, many of the sim creators would design fantastic shops - but they would often hide or obscure the products of the respective merchants. For The DragonSpire, I created empty cave-spaces to the maximum size specifications. 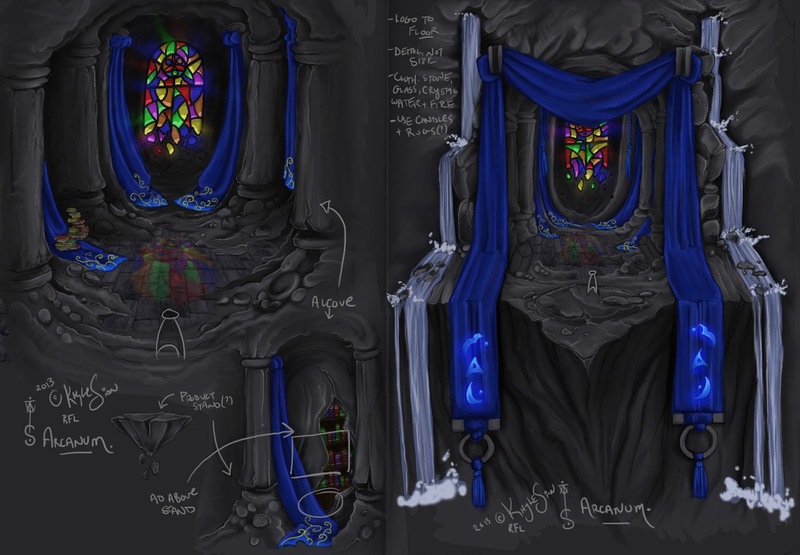 After handing each merchant a package of stones, signs, crystals and stalagmites, I invited them to create their own interiors for their hollow spaces - and boy did they deliver! Something I did not expect, however, was how difficult the entirety of the sim would be to photograph. This (aside from the manner in which the caves rendered shadows and the fact that several people (including myself!) got downright lost) seemed to be the main gripe for most people - the fact that they traveled down into the depths of the catacombs, and it was very hard to get a decent picture due to camera positioning in the tight space. This has to be my favorite. I don't think anyone took a better photo than this. It was taken by Opal Lei. Her blog "Where's Dim Sum?" is awfully cute, and her SLtography is spectacular. She captured exactly how I wanted The DragonSpire to look. 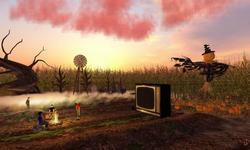 This one was taken by Caitlin Tobias, who wrote an article about the sim on her blog. She, like many others, was one of the individuals challenged by the un-photogenic properties of the sim - but managed to take a few good shots of the spire, anyway! A great interior photo taken by amanfor4seasons. I really enjoy the composition of this photo. It would have been a hard shot to get! For those who managed to find their way through the underground caverns, and made their way to the under-grotto, there was a secret gift for all to find! These pets are considered a Limited Edition item. 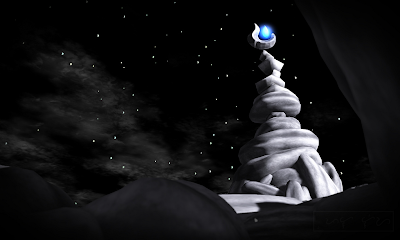 Scattered around the hidden grotto were tiny nests filled with eggs. If you took an egg from the nest, and wore it for exactly one hour, a baby Fairy Chameleon would hatch! 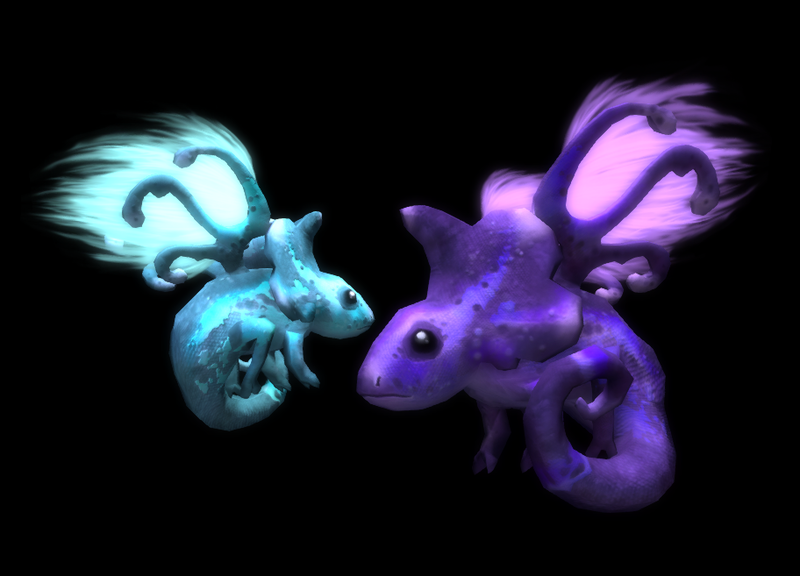 These Chameleons came in two flavors: RFL Purple, and Key of Hope Cyan (only available via the Key of Hope hunt)! 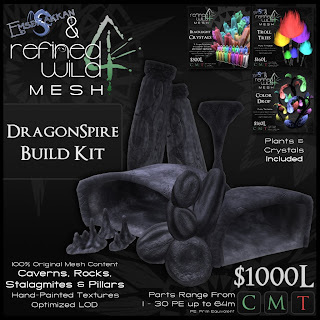 They are 99.9% MESH (aside from the flexi-prim wing fluff), have matching particle effects and will sit lovingly on your shoulder, nose or ear. At the end of it all, I'd attempted to get as many collective screenshots of the sim I could get from various people. One of the sadder things about the Faire is that it is not permanent – two months' worth of work is destroyed in a matter of seconds. I suppose that's something I like about it. There is definite beauty in impermanence. And now, this is the part where I express my unending gratitude. 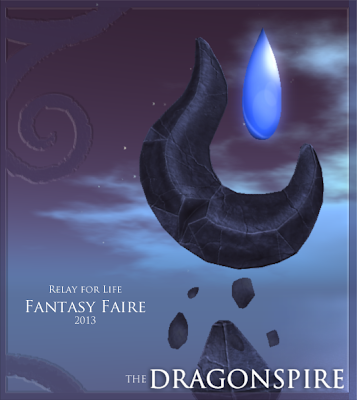 The DragonSpire would not have become a reality without my small team of best friends and colleagues. With how utterly chaotic March/April has been for me, this project would have absolutely overwhelmed and buried me if it had not been for the help and encouragement of my team. 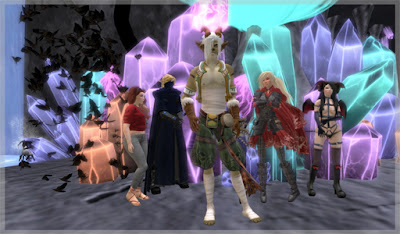 From left to right; Viodelic, Elysium Hynes, Saikatsu Epsilon, Khyle Sion, Astrea, Methias Kira. I also want to thank Elizabeth Tinsley and Zander Greene, who have been absolutely and completely supportive throughout this elaborate venture. Everyone really wanted to make this sim a reality. The passion and dedication shown by everyone was astounding. I have had the opportunity to work with the most cooperative and manageable team I could ever ask for.